UNIQUE FOOTBALL COURSES AND BIRTHDAY PARTIES! Football Squirts® offers unique football courses for young children between the ages of 2 – 6 years old.The structured courses are designed to teach young children the fundamentals of football in a controlled and safe environment with the emphasis being on fun and enjoyment. Our games educate children through the creativity, imagery and problem solving of our games. Football Squirts encourages participation from boys and girls. We welcome children of all abilities as our classes are designed to give young children a positive experience through sport from an early age. Our unique courses encourage the development of children’s motor skills such as spacial awareness, balance, coordination and laterality. Your child will become part of a group, this will help your child learn valuable communication skills, team work and co-operation and provide lots of interaction with other children. It’s never about winning at Football Squirts®, its about having a great time and enjoying the unique class. We believe starting sports at a young age will promote a healthy life and above all we recognise that all our squirts love the football games we play! 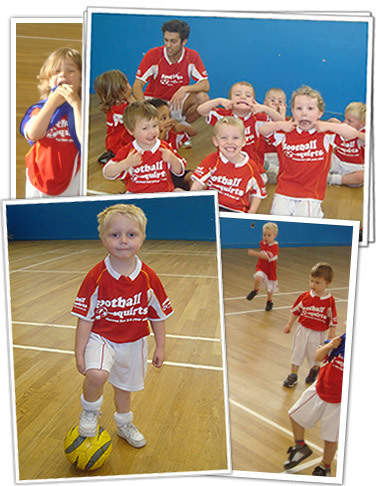 We offer a fun filled environment where your child will learn the fundamentals of football. Our unique games promote a boost in confidence and team work skills whilst giving your child a positive experience of sport from an early age. Are you looking for a children’s football party that your child and friends will remember for a long time? Football games, two qualified coaches, invitations and more! Available for football class school hire. We offer classes for Early Years to KS3 children. Football squirts in your school can be tailored to a specific topic, related to the national curriculum or just be a fun one off class.